Leave the City of Angels for angelic Yosemite on this over-night trip. 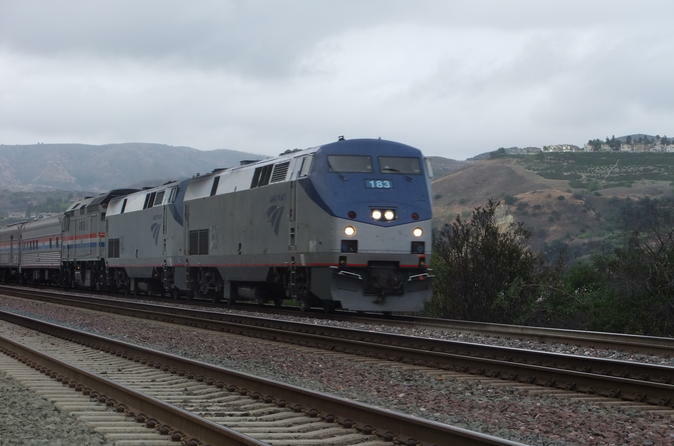 Hop on the Amtrak from Los Angeles to Fresno where you'll spend the night. The following day, explore Yosemite, arguably America's most beautiful swath of nature. Take an optional stroll on the 4-Mile Hike trail and see breath-taking natural sites such as Bridalveil Falls, El Capitan, The Chapel, Sentinel Bridge, Half Dome, Yosemite Falls and so much more. If you are travelling from Los Angeles to San Francisco or the other way around and would like to visit Yosemite on your way this is a perfect tour that you can take. No other tour offers this convenience and you get to visit Glacier Point, Yosemite Valley and Mariposa Grove of Giant Sequoias. If you like to hike this tour has an optional 4 mile strenuous hike. Hop on the Amtrak train from Los Angeles and enjoy the ride through California's great Central Valley, on the way to Fresno. Once there, check into your hotel and then take some free time, perhaps doing some gaming in the nearby casino or eating at one of the many fine restaurants in proximity to the hotel. In the morning, get shuttled to the natural wonderland known as Yosemite National Park. Pass through the small towns of Coarsegold and Oakhurst and then enter the park through the South Gate. Stop and get a great photo op of Yosemite Valley, Half Dome, Yosemite Falls, and Yosemite’s high country. Because of the smaller vehicle you're being transported in, visit parts of the park that are normally off limits to tours. Take a short walk to Glacier Point to get a commanding view of Vernal Falls, Nevada Falls and the Merced River, among other sites. Once at Glacier Point, consider doing the optional hike on the 4-Mile Trail, an easy preamble, ending at Yosemite Lodge where you'll re-unite with the group. Take a break for lunch and then continue exploring enchanting Yosemite Valley, lingering in the meadows below El Capitan and then visiting the historic Wawona Hotel. After a day of discovering incredible Yosemite, head back to Fresno to catch the train to Los Angeles.